Theta One & Theta Activate – Results Within Minutes! LifeWave’s Theta Nutrition centres on breakthrough formulas that provide essential and functional nutrients for your body. What distinguishes Theta Nutrition from other supplements? Activated by a special nutrient delivery system, these formulas help people experience beneficial results in just minutes. Safe, effective and stimulant-free, Theta products are also made with natural premium ingredients and contain no artificial sweeteners, colours or preservatives. 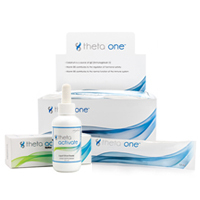 Theta Nutrition also includes Theta Activate which is the proprietary nutrient delivery system that activates the nutrients in Theta One. Most people feel results within minutes.